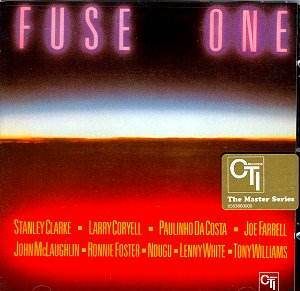 This disc is a welcome addition to the discography of the now almost forgotten woodwind master Joe Farrell. Farrell was a multi-instrumentalist who chose to concentrate on tenor and soprano saxophones and flute. From the late 1960s onwards he was a highly sought after session player who appeared on many of the most significant recordings right until his early demise in 1986. He played with the Elvin Jones Trio, Chick Corea's Return To Forever and the earliest editions of Mingus Dynasty. My first recollection of him is as the player who produced the wonderful obligatos on Roberta Flack's first major album, " Quiet Fire." Farrell is the featured soloist on the majority of this all star date and acquits himself with his usual aplomb and immaculate taste. He was a performer who was equally at home on straight ahead jazz, crossover music or more popular styles. He seemed to have the ability to adapt his talent to whatever was required without losing one iota of integrity. Although no credit is given in the personnel listing it is obviously Farrell playing the wonderful flute solos on many of the selections here. Unlike the majority of the recent CTI reissues, this one is made up of original material and is none the worse for this. The other players are a veritable who' s who of session musicians associated with this style, and indeed, with this particular label. Apparently this record proved to be not so popular at the time of its release - hopefully this new appearance will redress the balance.